As Angelina Jolie admits, she was just being playful when she told Sony Pictures Co-Chairman Amy Pascal that she wanted to be the next James Bond in the franchise a few years back. However, anyone who has been following the more playful side of the Oscar winner's career from Gone in 60 Seconds to Lara Croft: Tomb Raider all the way up through Mr. and Mrs. Smith and Wanted knows that aside from Kill Bill's Uma Thurman, if there's any woman who can pull off playing Bond, it's Angelina Jolie. And sure enough, Pascal found her an action role that allows her the opportunity to have as much fun as a man does with stunt-work galore in Phillip Noyce's over-the-top Salt. 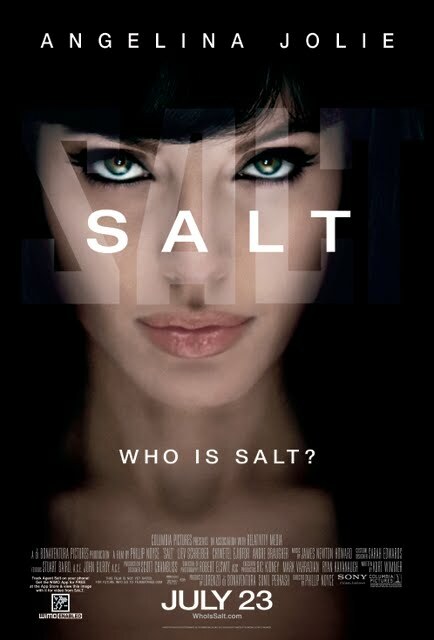 Originally, Law Abiding Citizen screenwriter Kurt Wimmer's Salt was intended as a vehicle for Tom Cruise who returned to the genre this summer as well in the lighter-hearted Knight and Day. However, when Cruise declined the role after citing similarities to his Mission Impossible trilogy, Jolie filled in as the renamed Evelyn (instead of Edwin) Salt, a CIA agent who finds herself on the run from her colleagues when a Russian defector shows up out of the blue and outs Evelyn as a sleeper spy from the Motherland who'd been trained decades earlier to assassinate the president of Russia. And even though her superior Ted Winter (Liev Schreiber) finds the idea that someone he's worked alongside and trusted for years could be a double agent nearly as preposterous as most viewers consider the ludicrously logic free screenplay itself, Evelyn doesn't do herself any favors by putting up a fight, bringing down any agent who gets in her way with an explosion worthy of Burn Notice as she breaks free of the barricades the agency has put into place to lock down security risks. Yet while Ted takes some convincing before he begins to doubt Evelyn, the counter-intelligence officer in charge of the situation – Agent Peabody (Chiwetel Ejiofor) – immediately takes Evelyn's escape from headquarters as a sign of guilt as they follow Evelyn on the first of several multiple location chases, executed with breathless style by not only the film's stunt coordinator Simon Crane but cinematographer Robert Elswit and editors Stuart Baird and John Gilroy. In fact, from a viewer standpoint, it's this first elaborate cat-and-mouse sequence that pretty much determines whether or not you'll like the film as, from scaling the outside of an apartment building barefoot in winter to playing leapfrog from one truck to another, Jolie seems to transform from believable woman on the run to Catwoman without the fancy get-up (sorry, guys). While half of the audience began rolling their eyes or chuckling lightly, the other half that had gone ahead and shut their brains off for roughly one hundred minutes sat back and enjoyed the ride. And even though it's fairly easy to predict several of the film's major twists including a final one that needlessly has to be explained in endless detail in one of those big, dumb cliched “killer's confessionals” where an unmasked villain must go over their plan for no reason necessary when time is of the essence, basically I tended to fall in the latter category during Salt. For the most part and big gaping logic holes be damned, I found myself “loving the spin” we were in as Noyce used “That Old Black Magic” to weave a spell for an engrossing popcorn thriller. Of course, the whole movie falls apart the second you walk out of the theatre and begin to pull on the many threads left hanging in any given misdirection or plot device, including the “overkill” of one character who gets choked for revenge even though they would've been ousted for the scum they truly were as soon as another character regained consciousness and cleared up a big misunderstanding. Nonetheless, without this extra moment of absurdity, we wouldn't have an even greater one at the end of the film that sets up the possibility of -- if not a sequel-- then at least a chance for Jolie to play Jason Bourne now that she's tackled James Bond.